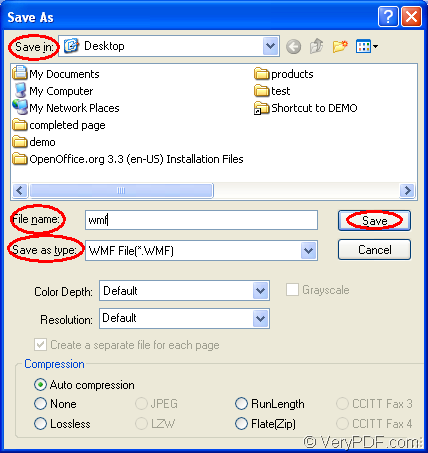 How to convert documents of OpenOffice to WMF? In this article, you will see the specific steps about converting document of OpenOffice to wmf with the help of a professional document converter-- docPrint Document Converter Professional. It is an application that supports to convert any printable documents to various image formats. So to docPrint Document Converter Professional, this conversion is only a piece of cake. There is an internal application in docPrint Pro (The short name of docPrint Document Converter Professional), which can act not only a virtual printer but also a document converter. The name of the printer is docPrint. As a virtual printer, it can save paper and ink by controlling the page size; As a document converter, docPrint can convert any types of printable documents to image formats and you can master it in a short time for it has an easy and friendly interface. For using docPrint, you should download docPrint Pro at http://www.verypdf.com/artprint/docprint_pro_setup.exe and install it on your computer. You just need to print the OpenOffice document to docPrint to launch the document converter. Please see the following contents to get the specific steps about the conversion from OpenOffice to wmf. Please run the printer driver under the following two situations at first. If docPrint is the default printer, you should right click the document and choose “Print” option to run the printer driver directly, which is the most convenient and fast way. If docPrint is not the printer driver, please open the document and press “Ctrl”+ “P” or click “File”—“Print” to open the “Print” dialog box in which you can set “docPrint” as the current printer in “Printer” combo box. Then please click on “Print” button for continuing your work. Then you should try to open the “Save As” dialog box in which you can set parameters to the target file and run the whole conversion. 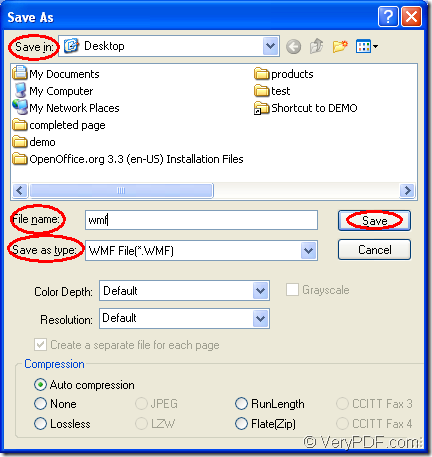 You can use any one of the following ways to open “Save As” dialog box. Click the “Save File” button in the toolbar. Use the hot key “Ctrl” + “S” combination. Click “File” and click “Save as” in the dropdown list. At last, just make some changes to the target file in “Save As” dialog box like the operations shown below. Choose a suitable location for the target file in “Save in” combo box. Input a good name for the target file in “File name” edit box. Specify the output format in “Save as type” combo box. The Figure1 can show you the “Save As” dialog box. Those are all the steps about the conversion from document of OpenOffice to wmf and you must have got some useful information. To get more functions about docPrint Pro, you can click here to visit its homepage. How to convert OpenOffice documents of ODT to WBMP? How to convert doc to ps using Document Converter? How to convert MS Office PowerPoint documents of PPT to PGM? This entry was posted in docPrint Pro and tagged OpenOffice to wmf. Bookmark the permalink.